"access is a privilege, not a right." "For research needs and communication"
Each modern school or district has policies pertaining to the use of technology in and out of the classroom. These rules may be in the form of an Acceptable Use Policy (AUP) or a Responsible Use Policy (RUP), the difference between the two being the emphasis either on enforced restrictions (AUP) or thoughtful and informed use (RUP). Most institutions are now leaning toward RUPs because of the pervasiveness of technology in the lives of students. It is becoming increasingly difficult to police students use of devices and at the same time increasingly important for them to learn the "hows and whys" of personally responsible technology use. 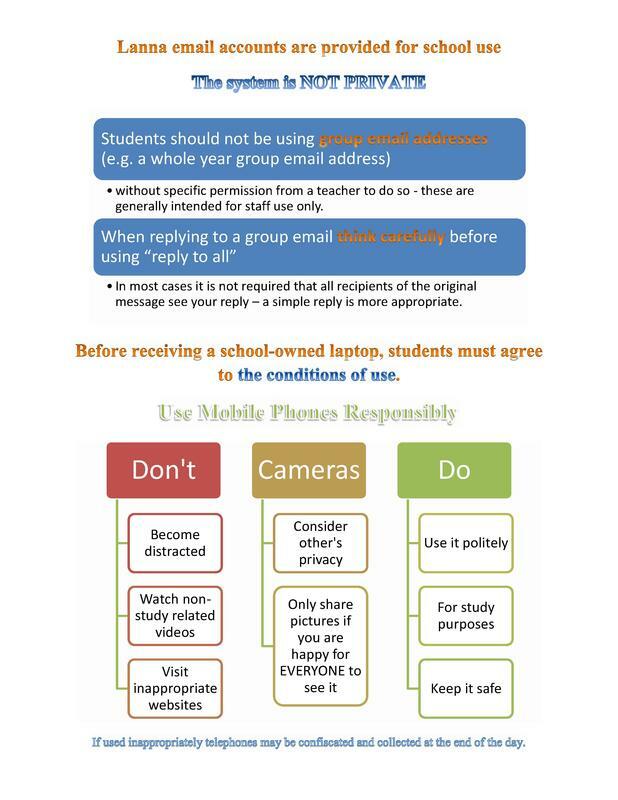 Using the Tech policies explained in the Lanna Secondary School Student-Parent Handbook (2017-18 ed. ), which is published yearly by the Lanna International School in Chiang Mai, Thailand (chosen as an example, other school policies may vary); an infographic was synthesized from the information to create a set of simplified visuals which could be helpful for students and teachers alike. The infographics are found below and can also be downloaded in PDF. 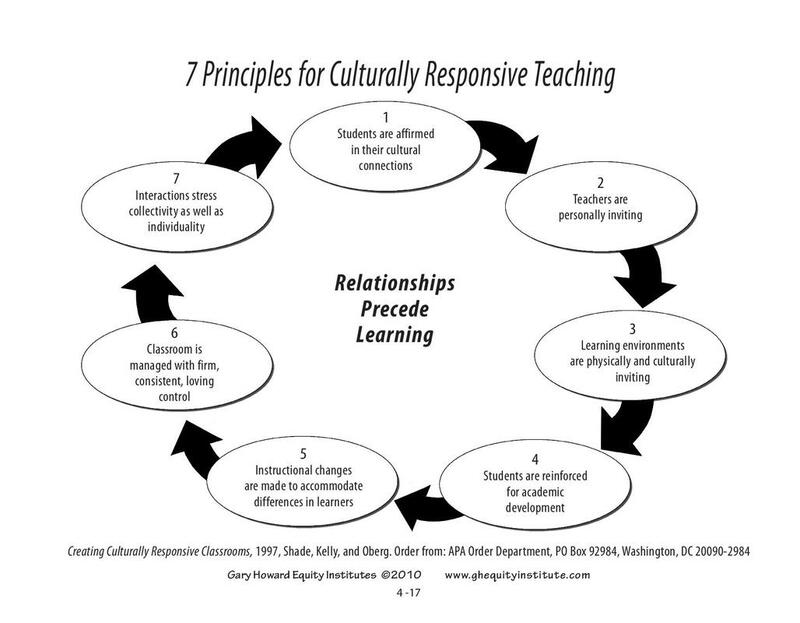 Culturally responsive teaching is about using students’ cultural learning styles and tools to activate the memory and processing structures in the brain in a way that is familiar. This can be done by creating lessons around songs or videos of short films or even storytelling. The spoken-word traditional learning schema can be activated and help to get across concepts that might otherwise be a struggle to understand from a text-book for students who are accustomed to auditory learning. Blended or “flipped” learning can be utilized effectively to incorporate technology and affect cultural responsiveness. More on this here and below. Click the button below for an online presentation to help students use classroom technology in a socially responsible and ethical way in accordance with the applicable guidelines and policies. The following is a “just-in-time” (JIT) lesson in the form of a provocative open ended question which allows an opportunity for students to “take a stand and justify their position” as outlined by Gregor Novak (2014) in an Edutopia article titled “Just-in-Time Teaching: An Interactive Engagement Pedagogy”. These questions can be answered to explore some of the social implications of technology use. The linked presentation (same as the button above) can help to explain some concerns and best practices. ​Susie has a crush on a boy at school named Bill. Bill doesn’t know it, so he asked another girl named Karen to go to a sports event with him. That made Susie jealous and she felt angry at Karen. One day, while using a computer at school, Susie opened a social networking site and noticed that Karen had left her account logged in, so instead of logging out of Karen’s account, she decided to upload a photo that she had taken of a group of students with her cell phone. Karen was in the photo next to a boy who was not Bill, and Susie cropped (edited) the photo and drew hearts around Karen and the other boy to change the context. After uploading it to Karen’s profile, Susie wrote a message on it, pretending to be Karen, that she knew would upset Bill and put in some bad language about the school to try and get Karen in trouble. What do you think will happen to Karen and Bill? What about Karen’s parents or the school administration? Could this jealous act by Susie have long-lasting negative effects on her’s and the other people’s lives? if so, what kind of effects? The online presentation linked above also addresses the ISTE standards (more information about these in the next section) for students pertaining to “Digital Citizenship” with regards to safety, security and ethical concerns. ​(ISTE Standards for students, 2017). More about ISTE standards in Section Two. Continue to Section Two for information about Determining the Credibility of online sources and the legalities of Copyright Compliance and Fair Use.